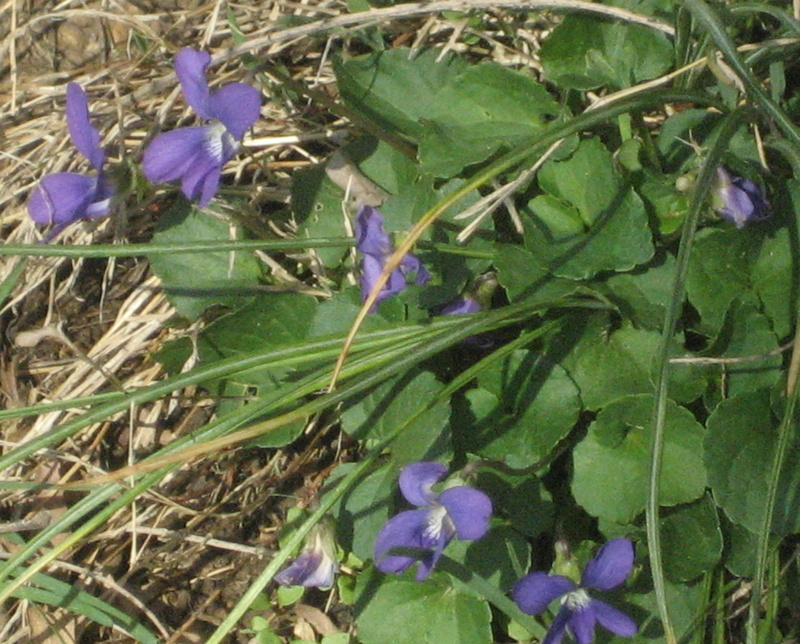 Violets are blooming all over southeastern Pennsylvania this week. 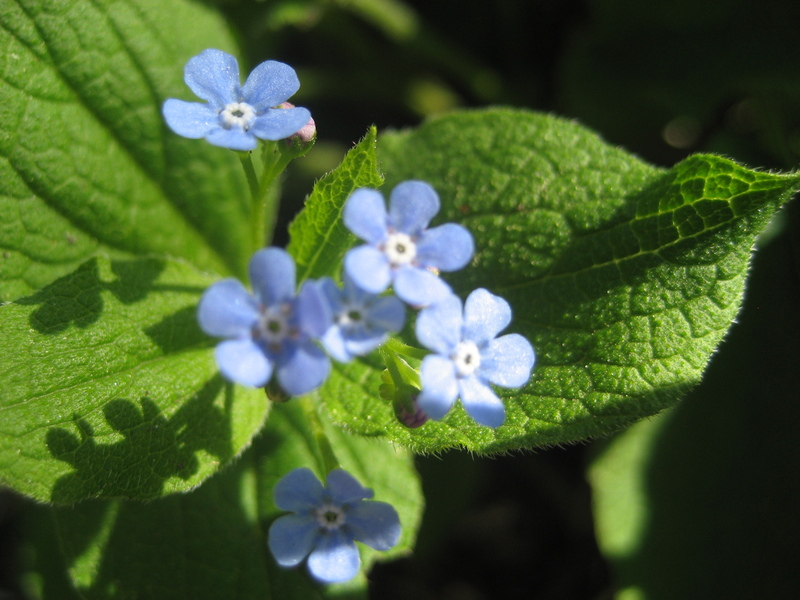 Their pretty little blue flowers bob above big clumps of heart shaped leaves where gardeners encourage them, and above little clumps of heart shaped leaves where they have tried to eradicate them. Every year about this time I wonder if I should just let them grow instead of trying in vain to weed them out my garden every year. 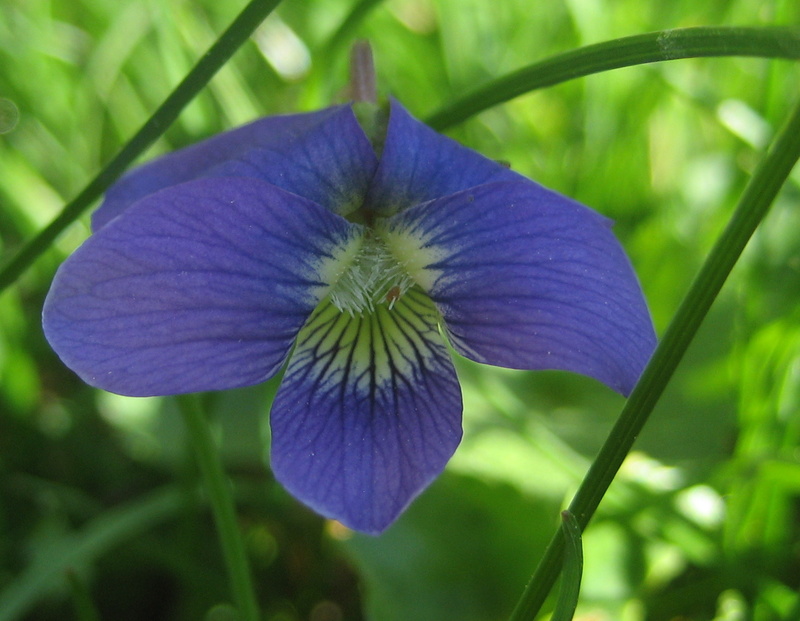 We’re talking the wild violet here, or viola papilionacea, not their fancy viola cousins for sale at garden centers. These are the ones that just show up. Who decides which plants are weeds anyway? 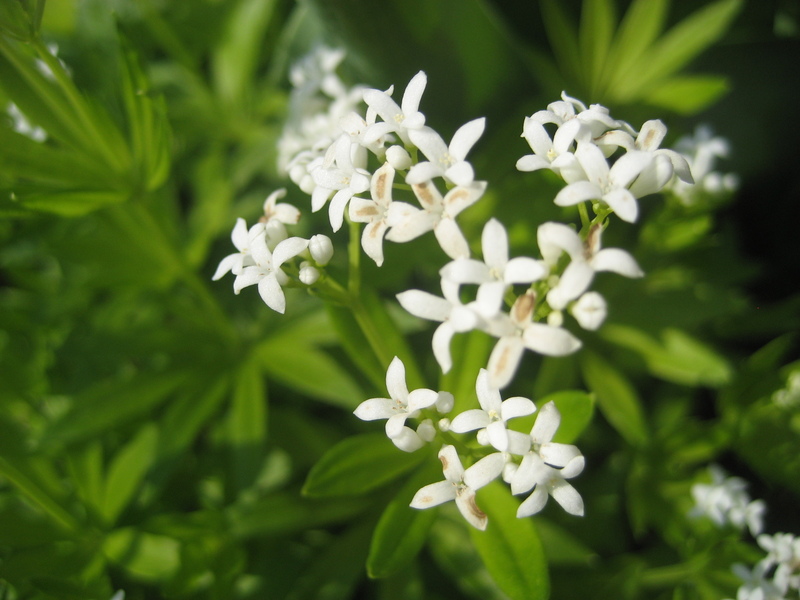 The folks who named milkweed, Joe Pye weed, butterfly weed and sneezeweed clearly had some question about their value in the cultivated garden. 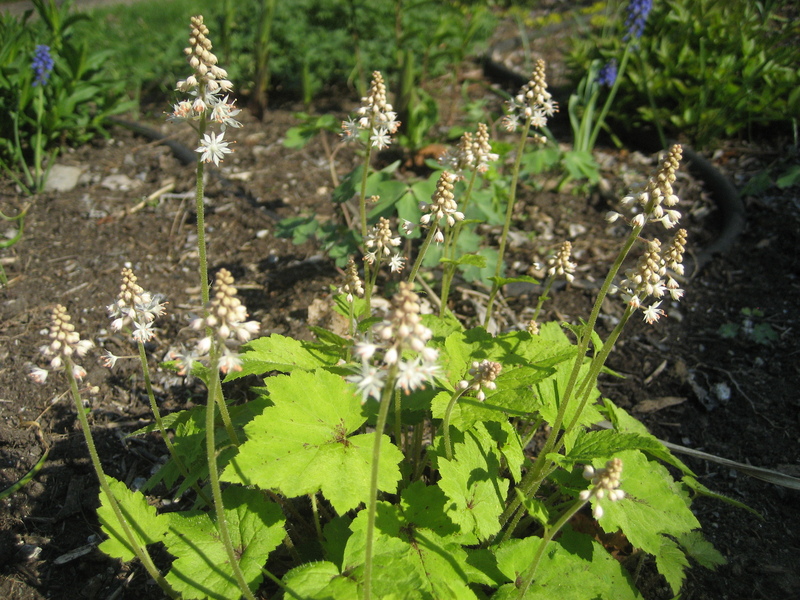 Yet native plant enthusiasts (myself included) pay cold hard cash to buy them at fancy nurseries and then feature them prominently in their borders. “Light and beauty enveloped her. She had fallen on to a little open terrace, which was covered with violets from end to end. . . . From her feet the ground sloped sharply into view, and violets ran down in rivulets and streams and cataracts, irrigating the hillside with blue, eddying round the tree stems, collecting in pools in the hollows, covering the grass with spots of azure foam. But never again were they in such profusion; this terrace was the well-head, the primal source whence beauty gushed out to water the earth. . . . George had turned at the sound of her arrival. For a moment he contemplated her, as one who had fallen out of heaven. He saw radiant joy in her face, he saw the flowers beat against her dress in blue waves. The bushes above them closed. He stepped quickly forward and kissed her. ” (from A Room With A View). Wow do I wish I could write like that. So why not let them run in rivulets, irrigate my hillsides, eddy round my tree stems and cover my grass with spots of azure foam? 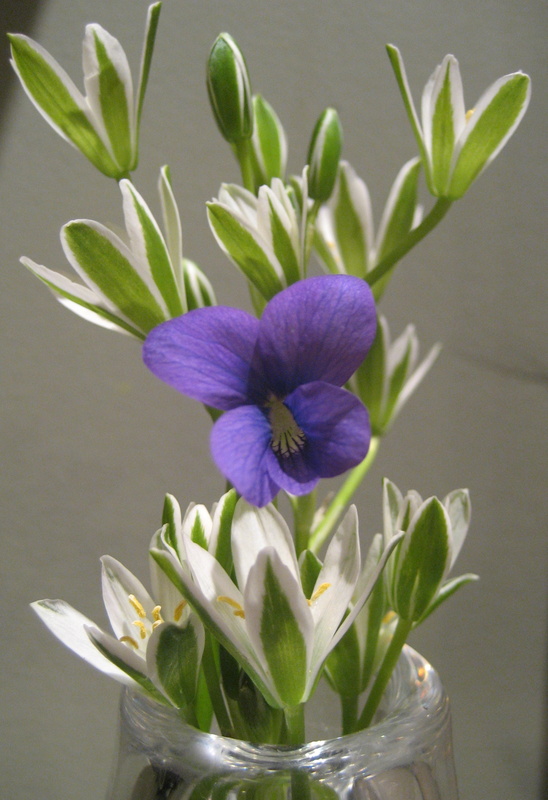 Violets will do just that if left to their own devices. They are immune to most herbicides, weed and feeds don’t do the trick and REPEATED applications of Round-Up are necessary to make a dent. And this only if you’re willing to douse your garden with chemicals, which I am not. So I usually try to dig them up and throw them out, to no avail. You know, in the woodland section at the Missouri Botanical Garden, their violets are labeled with those nice little name tags I love so much. That must mean they want them there. Here’s my plan then. If they get shaded out, too bad for them. But if they really want to be here, I think I ought to let them. (I speak here as if I had a choice in the matter). Who wouldn’t want a flower that can fill your face with radiant joy and cause the George Emersons of the world to notice? My friend Paul, an avid up-before-dawn birder, once made a great comment to me about cardinals. How lucky we are, he said, to have this amazing, tropical-looking scarlet bird eating at our feeders during the depths of winter. Don’t take for granted this fabulous, showy bird just because it’s native to our area. 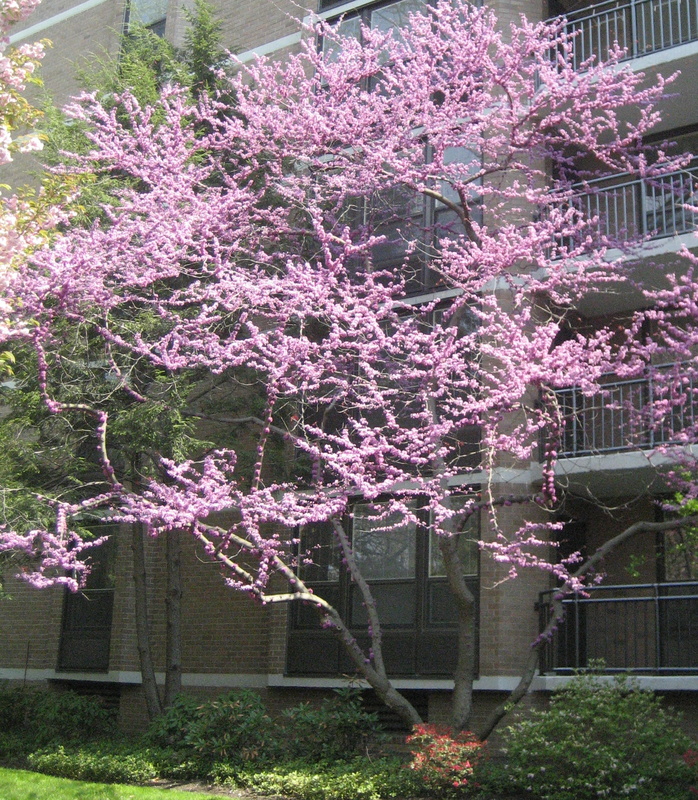 Since I’m not an up-before-dawn anything, I’m going to preach the same message about my favorite tree: the eastern redbud (Cercis Canadensis). How great is it that this April show stopper belongs here. Not some import from Japan or China, the redbud flashes its bloom laden branches and we here in North America get to enjoy it guilt free. 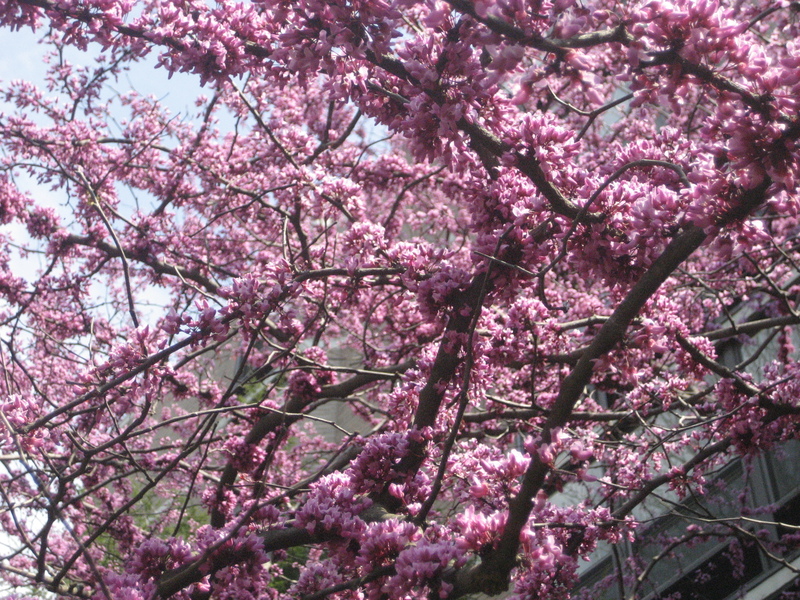 Hey – I have a redbud. I’m sustainable! I support local insects! I didn’t import any nasty elm-killing, chestnut-blighting hitchhiking fungus! 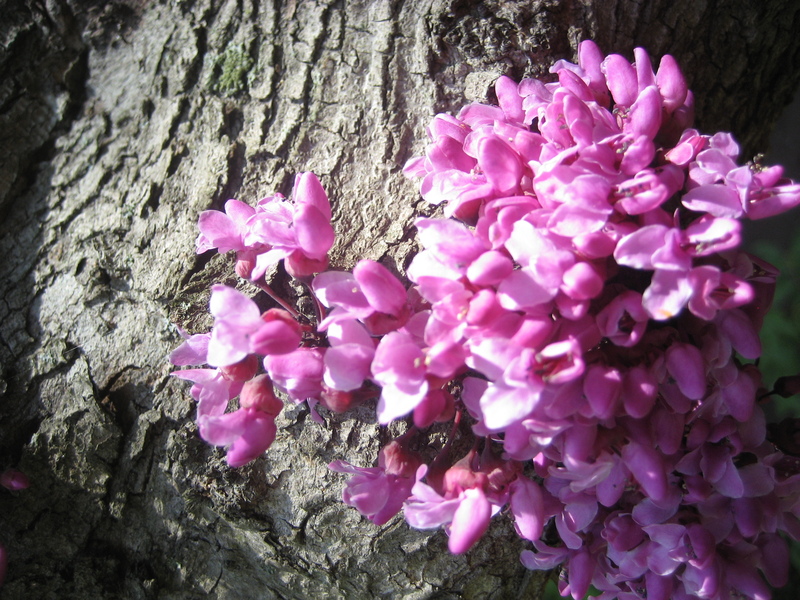 See – you can feel good about owning a redbud. But even if you don’t look over your shoulder guiltily whenever you plant a non-native (true confessions), you must admit the redbud is spectacular. The blooms burst right out of the bark for goodness sake. My dad always said he loved them in the spring, but they were horribly ugly the other 49 weeks of the year. I must disagree. They have beautiful heart-shaped leaves and grow up to 30’ tall so they can provide shade if planted strategically. 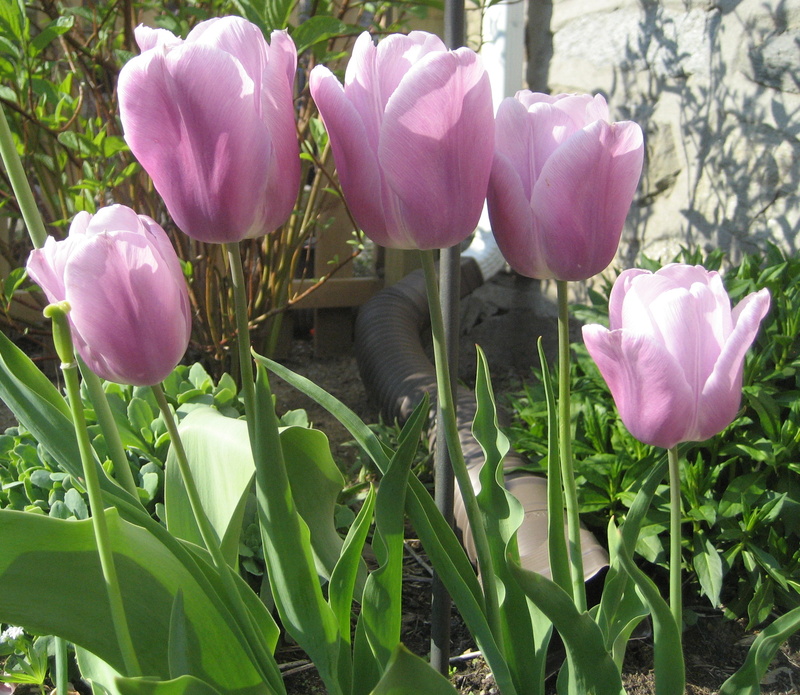 They love full sun to part shade and well drained soil. Apparently they don’t transplant well, but I’ve moved mine twice and its doing great. 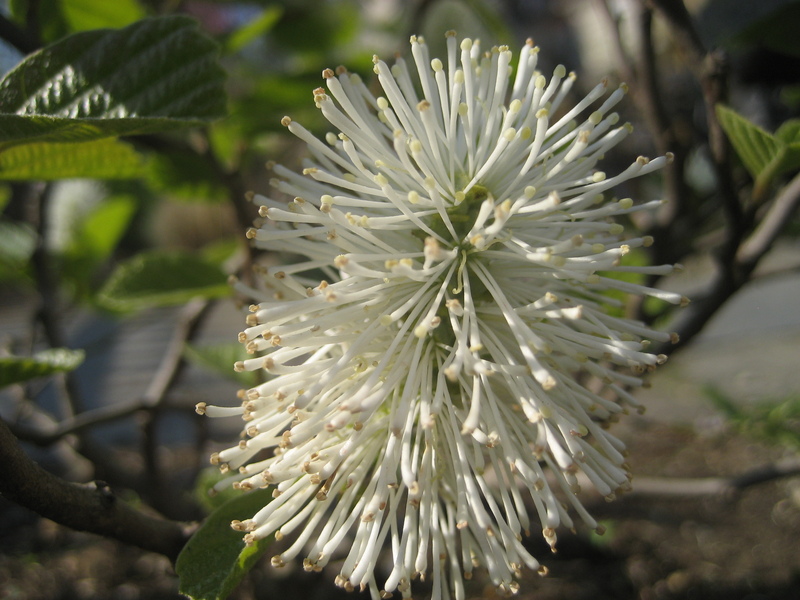 Plant one next to a white dogwood and you’ve got a gorgeous pair all year round. So there you go. 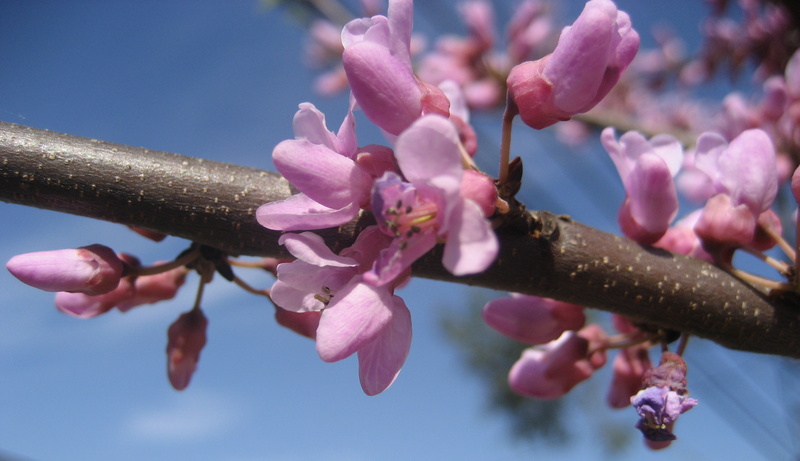 Plant a redbud. 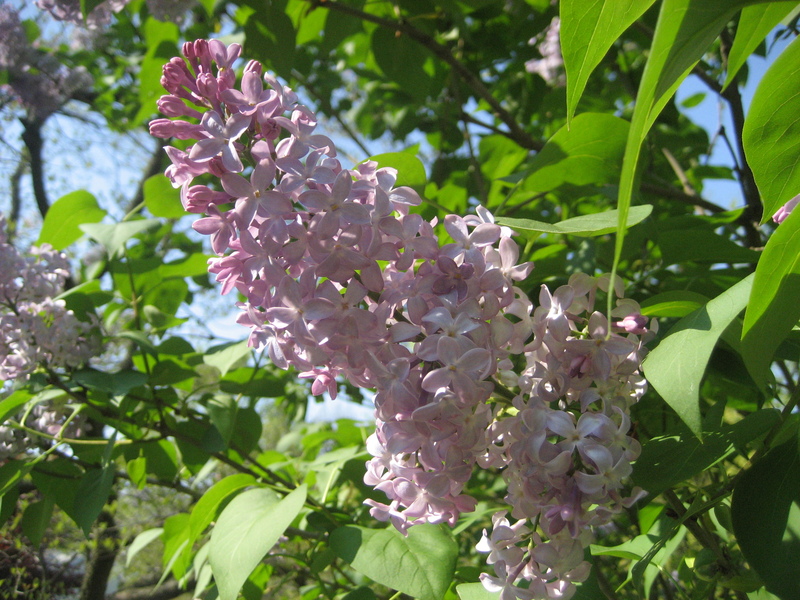 And then be amazed with me at this spring and the bounty of blooms we have to enjoy on tax day. 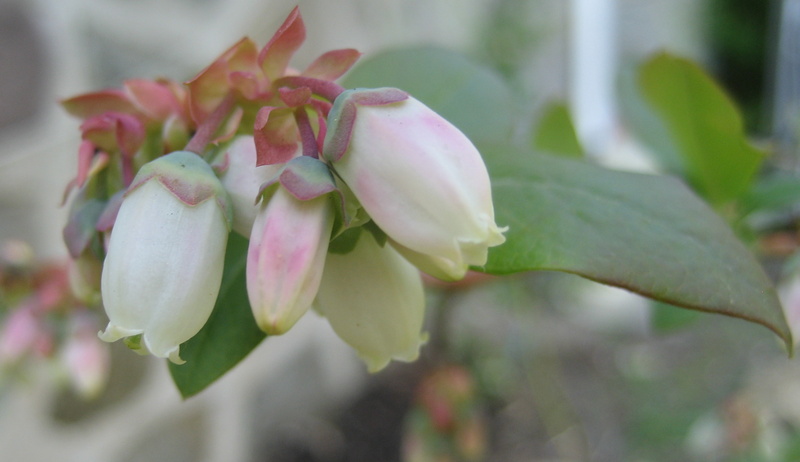 Thanks to Carol at May Dreams Garden for hosting Garden Bloggers Bloom Day every month. Very fun! The quest: to find naturally occurring color outside in the middle of January. The location: my little neighborhood near Philadelphia. Certainly, I enjoy paging through glossy gardening magazines to see lush fields of lavender that bloomed in France in some long-passed August. Sure, I score a bit of a color fix with my annual attempt at orchids. (Here’s a quick rundown of my orchid calendar. Jan & Feb: enjoy delightful blooms. March thru May: try to remember to water. June thru August: remove leaves that died because I forgot to water. September thru November: remove more leaves that died because I over-watered. December: neglect completely, hide behind poinsettia. January: start again). But magazines don’t quite do it, and my house plant casualty list keeps growing. This all begs the question: is anything alive out there? Anything at all? Given my new resolve not to be brought low by winter this year, I took the only logical first step. I went outside and started looking. 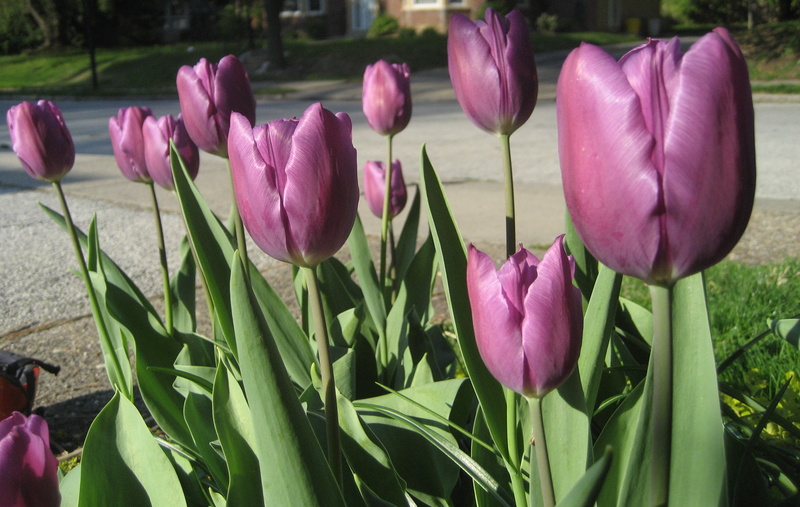 I know in my head that life is teeming under the surface – tulip bulbs put down roots, lilacs gather their energy in tiny branch-tip buds, giant oaks rest before shooting out an army of leaves. In my heart, though, I’d rather have some immediate gratification, thank you very much. So I looked. I looked as I drove my kids to school. I looked as I walked to the library. I looked, and amazingly, I found! Winterberry, a deciduous holly wins double points for being a native plant, as does beautyberry. 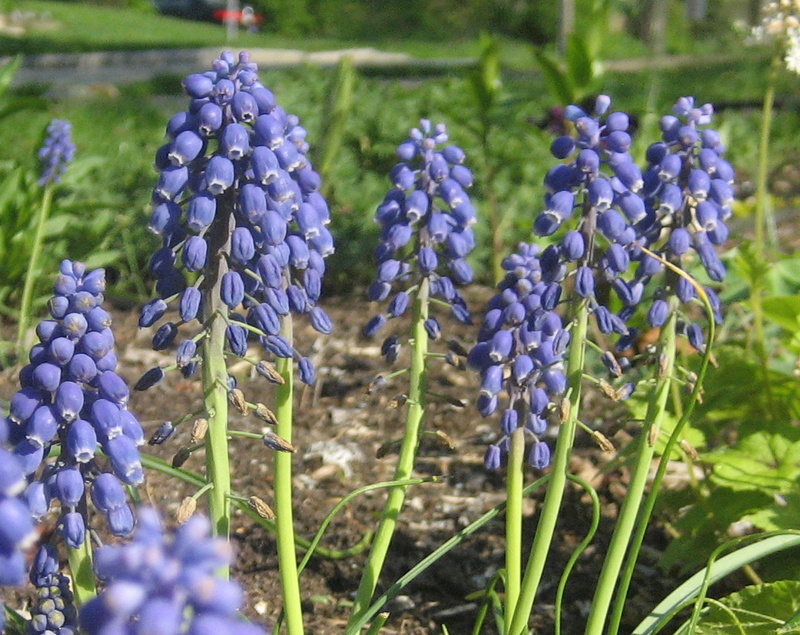 Not only do they cheer up a dreary winter day, they were made to grow in this soil and to feed the birds and insects that just happen to live near by. Both drop their leaves in the fall to show off their lovely little berries, encouraging birds to eat and deposit their seed far and wide (and encouraging me with bright color in January!) And they’re both growing in right around the corner and they’re both gorgeous! I’ll add “plant winterberry and beautyberry shrubs” to the long list entitled, “Things I would do if I had a bigger yard.” Oh well – at least my neighbors have seen fit to help me out. What to do, however, if your fellow gardeners don’t take care of you quite so well as mine do? Read a book by Wendell Berry. This man is an artist. His books define life out-of-doors. He loves the land. His characters are real and deep and humble and loving. He will make you want to move to a farm. I bet even January is warmer in Port William.